Kayak diving is probably the most under-rated sport in the UK. It’s cheap, hassle-free, and much more convenient than lugging around a huge and thirsty dive boat. We have just the right kind of coastline for pottering around in the zone between an unsatisfying shore-dive and a stressful trip out to the deep and stormy water to justify the use of a powered boat. 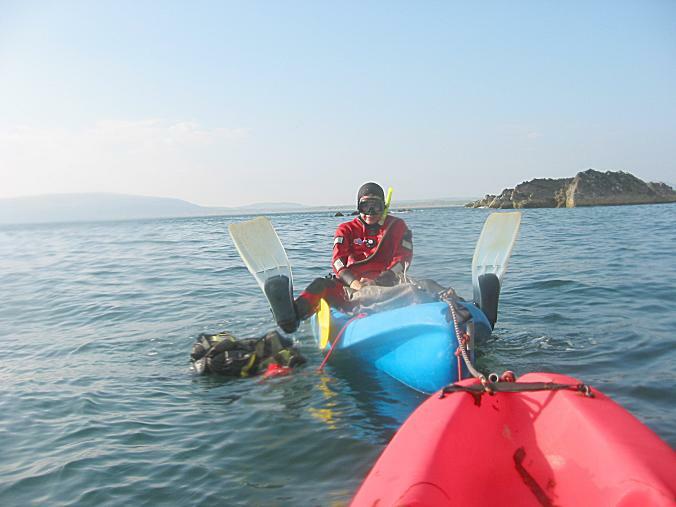 A kayak can take you several miles along a coastline to places where there is no easy access from land for divers and where you can enjoy a sensible, easy dive that is fun and which you have never done before. If it’s scary and you don’t want to dive, you don’t need to, because it’s a two-for-one, and you’re probably getting enough adventure with the paddling. When the weather gets really bad, you can leave your kit behind and go surfing, because that’s what these boats were originally designed for. 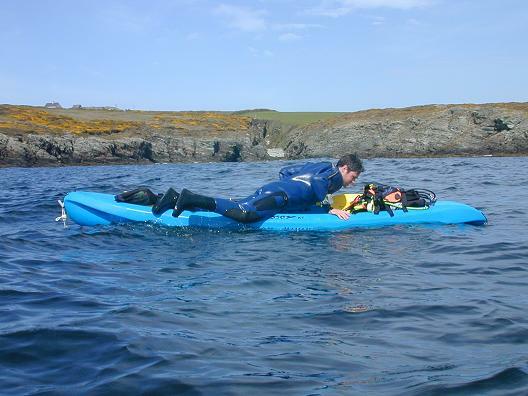 There’s only one thing wrong with kayak diving in the UK — not enough people are doing it, so there’s no one to go out with.Please join in if you can by getting some hard plastic sit-on-top kayaks (not the inflatable kind), some paddles, an anchor, and call us out on a trip some day. Photos, trips and other stories in reverse-chronological order. Smaller weekends get blogged on freesteel/kayak-diving. St Abbs July 2007 Finishing off Scotland at the easy place. Skye June 2007 The dive kayaking duo in some remote locations and lochs. Plymouth July 2006 Ten days with dive kayaking and some near perfect weather. St Abbs October 2005 Short trip, nothing special, but it’s a reccie for the summer. North Wales Weekends 2004/5. Mostly for the pictures from several short trips. Kayak Dive Ireland July 2004. I’ve always wanted to do that. A Marine Identification Course Ireland July 2004. The pictures are pretty, but the words got out of control during the ramble. Diving Kayaks Win Lleyn August 2003. Out again with my camera. Probably the one that’s worth reading. Pembroke Kayak Diving Nuts June 2003. With some trials in Anglesey. UK underwater piccies, but no story because nothing went badly wrong. Kayak diving April 2002. My first two weeks with my own two boats. Cosmo’s Boat in Liverpool Bay, Summer 2000.